The first machine, which was turned out during the years 1914 and 1915, was a biplane flying boat with the lower plane considerably smaller than the top, or as the Germans call it a one-and-a-half plane. The inter-plane ДальшеMore>>> bracing took the form of a series of vee steel struts forming a Warren truss as viewed from in front. The hull was of orthodox design vee-bottom front portion and a single step, with the aft portion cocked up at an angle and carrying the tail. Wing tip floats were fitted, but in the next and all subsequent models these were discarded in favour of short wing stumps projecting from the sides of the boat and providing lateral stability without the use of wing tip floats. The power plant consisted of three 240 h.p. Maybach engines. The machine had a span of 143 ft. 6 ins., a length of 96 ft., and a total wing area of 3.540 sq. ft. The machine was thus a very large one, especially considering that she was designed in 1914. Unfortunately no figures of wing and power loading are available, nor data relating to her performance. The latter must, however, have been such as to warrant going on with the experiments, although the next model was totally different in its general lay-out. 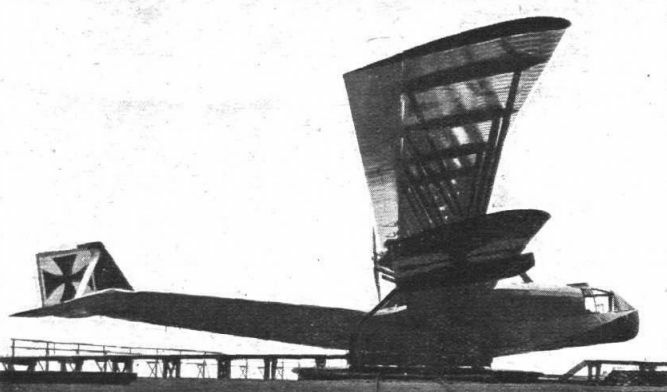 The Do.Rs.I: This machine is the first of the Dornier series of Zeppelin flying boats, and has biplane wings. All his subsequent flying boats were monoplanes.